I'm home sick today with this epic cold that, last night, led me to stay up until 5am drifting in and out of fever-dreams about David Chang (no joke, and it's less fun than it sounds). After finally caving to a double dose of Nyquil I've spent the rest of the day cocooned in bed feeling sorry for myself and wanting to die. This all has nothing to do with the fact that the latest in HP's attempts to sexify their netbook (Vivienne Tam, really?) has me completely enraptured. The darn thing is designed by Tord Boontje, which means it's one of the few things in the past day that's warmed my little Moss-obsessing design-snob techie heart enough to cut through the fog of this cold. It's also delightfully in line with my realization that what I need, computer-wise, is not actually a tricked-out laptop, but instead a serviceable desktop machine and a nice handbag-friendly netbook. 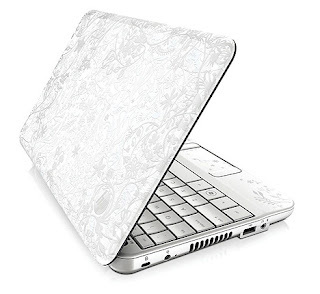 And a wee little netbook laser-etched in Boontje's awesome techno-flora graphics, cute enough to get me to abandon the Apple brand-loyalty I've carried for all twenty-seven years of my life? Yes and yes and yes, please.